Entertainer Ronnie Corbett, best known for BBC comedy sketch show The Two Ronnies, has died aged 85. 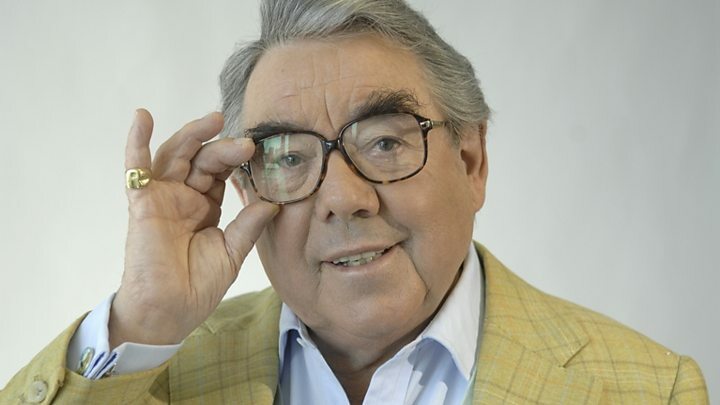 His publicist said: "Ronnie Corbett CBE, one of the nation's best-loved entertainers, passed away this morning, surrounded by his loving family. Following Barker's death in 2005, Corbett continued to be regular fixture on UK TV and is perhaps best-known for his armchair "shaggy dog" sketches. His most memorable solo projects include the sitcom Sorry! and the game show Small Talk. He most recently starred in the BBC Radio 4 sitcom When the Dog Dies. Sir Bruce Forsyth spoke emotionally about his friend, colleague and fellow golf enthusiast, saying it was "one of the saddest days of my life". "Ronnie was a friend, someone I admired so much. It's a very, very sad day. I'm going to miss him like crazy, I really will." Sir Bruce said one of the first times he saw Corbett was when he was working in the cast of a Danny La Rue show in the West End. "That was one of the wonderful things about Ronnie - he was very adaptable. He could work with anybody, even me," he said. "We always say a one-off, but he certainly was a one-off and a half. He really was." Veteran comedian and actor John Cleese, who worked with Corbett on The Frost Report, tweeted: "Just heard about Ronnie C. So sad. He had the best timing I've ever watched. He was a great, kind mentor and a wonderfully witty companion." Comedian Ricky Gervais, who appeared alongside Corbett in his TV show, Extras, tweeted: "RIP the lovely, funny legend Ronnie Corbett. It was an absolute honour and joy to have known him." Little Britain star David Walliams, added: "Goodbye my friend and comedy idol Ronnie Corbett Thank you for all the laughs. It was the greatest honour to know and work with you. Goodnight." Movie star Russell Crowe, added: "And it's good night from Ronnie Corbett. Thanks for all the laughs mate." And comedy star Miranda Hart, said: "Having a little weep at the death of one of my heroes Ronnie Corbett." Former BBC chairman Michael Grade also spoke of his sadness at the loss of Corbett, who he described as a "huge talent". He told the BBC the entertainer was "one of the all-time greats of British comedy, no question - I'm so sad for [his wife] Anne and the family - and the nation, really. We've lost a great friend and entertainer. "He learned his craft the hard way. He was a master of comedy of all kinds - TV, cabaret, variety. The most wonderful man." BBC director general Tony Hall called Corbett "a wonderful comic and entertainer". "A man of great charm and warmth who brought laughter and joy to millions. He was quite simply one of the true greats of British comedy." It was one of the West End's great disasters. Lionel Bart's Robin Hood musical Twang closed after just 43 performances but it was a stroke of good luck for a young Ronnie Corbett. Over cucumber sandwiches at The Ritz with David Frost he had been offered a starring role in his new satirical TV programme, The Frost Report. Suddenly freed from his duties as Will Scarlett, it was Corbett's big break in TV and paired him up with another performer, Ronnie Barker. And why had Frost chosen Corbett? He had seen him in a show in a London nightclub with Danny La Rue. There, in one story, is one of the main reasons Ronnie Corbett was such a popular performer - acting, revue, the 1960s satire boom, music hall - he brought it all together at the right time and the right place in one five-foot-one performer. Scottish-born Corbett started his TV comedy career on David Frost's satirical comedy the Frost Report in 1960. It was here he first worked with Barker, although they had met before, and formed the duo whose TV sketch show became a British TV classic, regularly cited by the public as one of their enduring favourites and by other comics as a big influence on their careers. 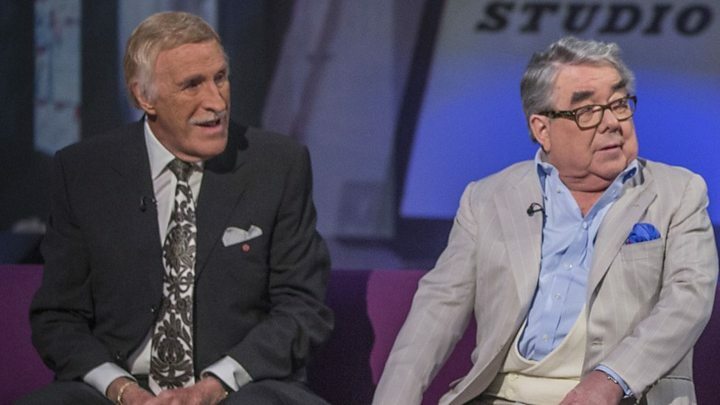 The Two Ronnies ran from 1971 to 1987 and saw the comedians take part in musical performances and sketches. Speaking to The Telegraph about how well they got on in 2013 he said of Barker: "We were a real couple with matching tastes and styles. "Of course we were quite different but somehow we fitted so well together. I think it's a more pleasant and palatable thing to see people being funny together because you're touching areas of truth. Dinner parties or falling out with people - it's the naturalness of it." The programme won a Bafta in 1972 for best light entertainment performance and was staple viewing for much of the UK audience on a Saturday night, with more than 15 million viewers. 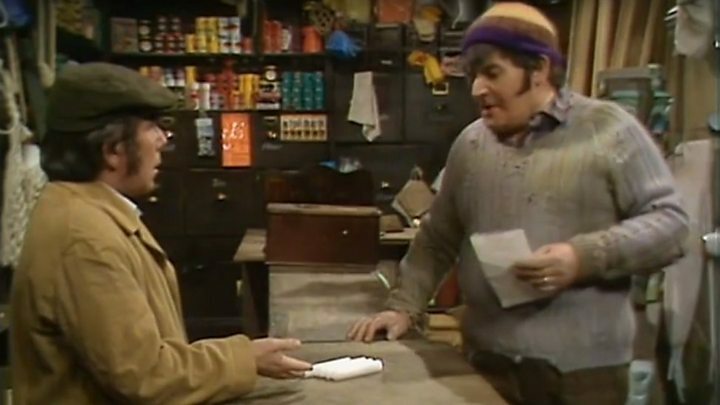 One of their most enduring sketches was the famous hardware shop "fork handles" skit. When on his own, Corbett specialised in long, rambling jokes delivered from an outsize armchair with his legs dangling in the air. Media captionFour candles: Ronnie Corbett's most famous sketch? Born in Edinburgh on 4 December 1930, Corbett was educated at the James Gillespie School and the Royal High School, Edinburgh. He did not attend university after leaving school and instead joined the Ministry of Agriculture. After two years he moved to London where his first roles were playing schoolboys due to his diminutive height of 5'1". Corbett also started to do summer seasons, intimate revues and running the bar at the Buckstone Club off Haymarket, central London, which is where he first met Barker. He met his wife, the actress and singer Anne Hart, while working at Danny La Rue's Club in London. It was here he was spotted by Frost who invited him to join Barker and Monty Python star John Cleese in The Frost Report, one of the most influential TV shows of the 1960s. One of the satirical comedy series' best-known sketches featured Corbett, Barker and Cleese. The social "class" sketch saw the comedy actors ranked in height order, which also corresponded to their class. Barker says: "I look up to him [Cleese] because he is upper class, but I look down on him [Corbett] because he is lower class." Corbett says: "I know my place." Following Barker's retirement in 1987, Corbett had a number of roles in the theatre, including The Seven Year Itch, Out of Order and The Dressmaker, while he also took guest roles on TV and in film. He wrote books including Ronnie Corbett's Armchair Golf, The Small Man's Guide To Life and his autobiography High Hopes. He was also a keen and proficient golfer, and a member of the Honourable Company of Edinburgh Golfers. He was awarded a CBE in the 2012 New Year Honours for his services to entertainment and charity. Corbett is survived by his wife, with whom he celebrated his golden wedding anniversary last year, and the couple's two daughters, actresses Emma and Sophie Corbett.